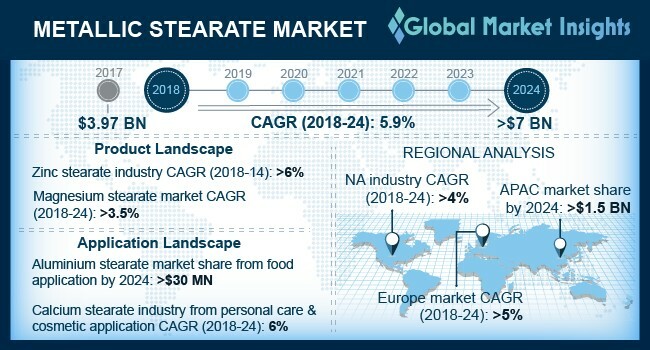 Metallic Stearate Market size will exceed USD 7 billion by 2024; according to a new research report by Global Market Insights, Inc. Rising metallic stearate demand in plastics, rubber, pharmaceutical, cosmetics and paints & coating industry should drive metallic stearate market. These intermediates are widely used as lubricant, plastic stabilizers and mold release agent in these industries. Recent upsurge in cosmetics and plastics industry owing to technological development mainly in Asia Pacific and North America along with rising demand for metallic stearate should fuel industry growth. Global zinc stearates product segment from cosmetic application will witness strong gains at over 6% during forecast period owing to its usage in formulation of products including mascara, eyeliner, lipstick, eyeshadow and blushers. It is generally used for its lubricating properties along with its ability to stop emulsions separating into liquid components and oil. Zinc stearate market is also expected to grow due to its astringent and antiseptic properties. Metallic stearates are defined as metal salt of stearic acid, an 18-carbon chain fatty acid which is commonly prepared by reacting stearic acid and metal salt such as metal hydroxides and oxides. Rubber and polymer industries are key application segment for these products due to its acid scavenging, hydrophobic and gelling properties. Metallic stearate market from polymer application should surpass USD 1.5 billion by 2024 due to its ability to improve surface texture of plastic along with improved function ability. Growth of plastic industries in Asia Pacific should draw sizeable demand for these products. Continuous rise in industrial activities such as construction and manufacturing along with economic boost should fuel metallic stearate market size. Global metallic stearate market is driven by rising demand for PVC (poly vinyl chloride) and other polymers. Use of these products in manufacturing different polymers such as polystyrene, polyolefin and phenolic resins will drive metallic stearate market growth. They are also widely used in manufacturing soaps and detergents owing to its hydrophilic properties which prevent moisture absorption and agglomeration. Calcium stearate segment size should grow at a rate of over 5.5% during projected timeframe. This rise in demand for this product can be ascribed to its use in paper production, lubricant and food application. It is commonly used in medical drugs and food in the form of stabilizer or emulsifier depending on its applicability. It is regarded as safe for human consumption making its useful in production of tablets and capsules as it prevents chemicals from sticking to each other during transportation and manufacturing phases. Global magnesium stearate demand from pharmaceutical application is expected to surpass 30 kilo tons by 2024. It can be attributed to its pharmaceutical excipient status meaning its incorporation among the FDA list of 40 official categories of excipients. It can be commercially produced from vegetable oil sources including palm and cottonseed oil. These products are also widely used as food additives driving metallic stearate market revenue. North America, led by Canada, Mexico and the U.S. metallic stearate market size should witness gains at over 4% during forecast timeframe and is largest market segment in terms of revenue. In countries including the U.S., presence of large base of manufacturing industries incorporating metallic stearate along with growing infrastructure and economic strength should boost regional demand. Global metallic stearate industry is moderately fragmented with key market players including Dover Chemical, Baerlocher, FACI, Peter Greven and Norac Additives sharing over 40% of the global metallic stearate market. Other industry participants include PMC Biogenix, Nimbasia Stabilizers, Lumega, IRRH Specialty Chemicals. Companies strive to move ahead strategizing for mergers & acquisition and partnerships to expand its regional presence along with extending its product portfolio.